January | 2010 | Frank & Donnis Travel Blog "the more we see the more there is to see"
We started the week with a tropical cyclone, “OLGA” crossing the coast north of Port Douglas and turning into a rain depression then heading west to the gulf country. There was also a cyclone called “WTF” (cause I cannot recall the name) which crossed the west coast and headed east. It turned into a tropical low and hovered off the east coast and joined forces with a monsoon trough. In the meantime “OLGA” re-formed in the Gulf of Carpentaria, did a 180 degree turn around and headed east once more crossing the coast near Karumba, also turning into a rain depression and joining the monsoon trough all headed south down through most of inland and eastern Queensland. So this week we have had strong winds heavy rains followed by sunshine followed by strong winds and rain and to cap it all off, King Tides, the highest in 9 years. This means that low lying areas got tidal water where they do not normally get tidal water. Combined with swells stirred up by the winds we also got surf where there is normally no surf. The heavy rain combined with low pressure sytems, King Tides and swollen creeks and rivers there is nowhere for the water to go except outwards so some flooding occurred in towns on waterways. Drainage systems backed up. 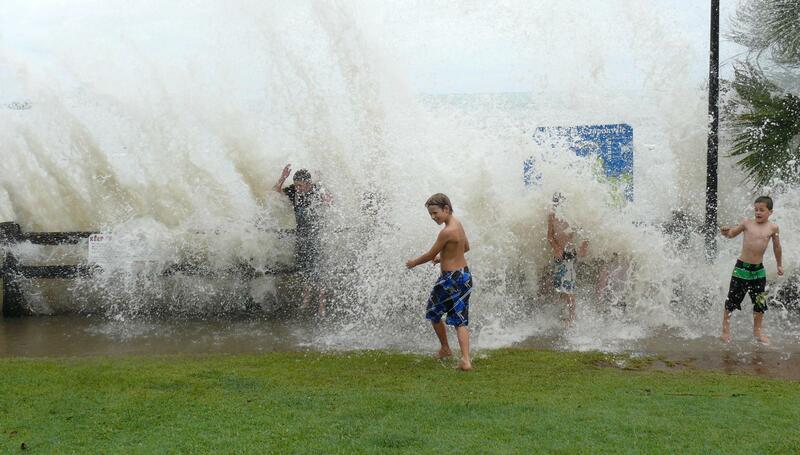 Fun but not for those with flooded cars and houses, especially for the salt water flooding. Here in Airlie Beach as far as I could see we escaped the flooding part but did get some incredible swells breaking against rock walls. The local kids loved it as the photos will show. FOR A BETTER VIEW OF THE PHOTOS, HOVER YOUR MOUSE OVER THE PHOTO UNTIL THE POINTER TURNS TO A HAND THEN CLICK. A LARGER PHOTO APPEARS. The swells rolled and broke along a rock wall sending showers of water into the air. The kids sat or stood or ran through it all. Even at my age I felt like stripping downand joining the kids. Probably dangerous for me but what the heck I enjoyed the thought anyway. Kids getting waved at Cannonvale Beach. We got married on this beach 11 months ago. Wave running along rock wall at Cannonvale Beach. 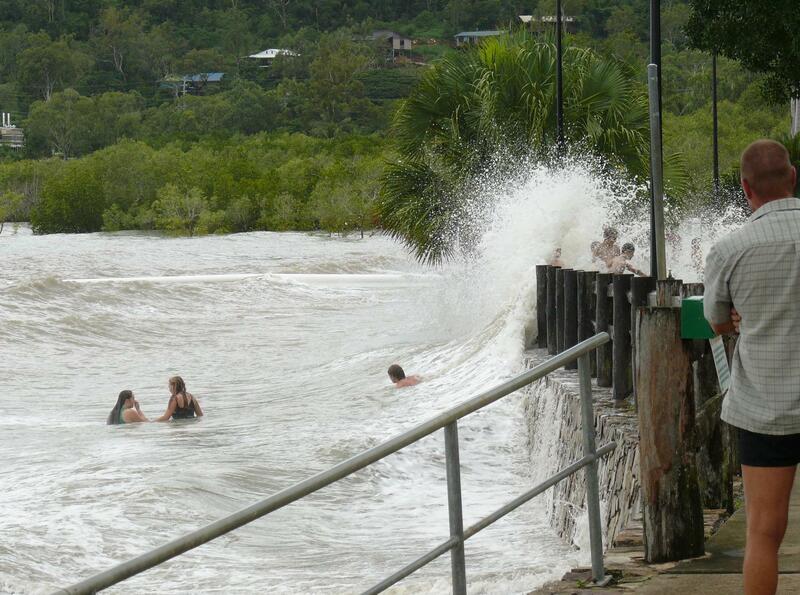 This looks like fun at Cannonvale Beach. On thursday WHEREWILLWEGO had the rear springs levelled up and an extra leaf put in the drivers side to compensate for the weight of fresh and grey water tanks on that side. So now instead of being down 35mm unladen on that sise it is 10mm unladen up on that side. Should make for a more level ride although to be honest I had not noticed bad riding or handling charateristics. I did have some reverse parking problems on our hitherto steep and uneven ground beside the house. The mud flap got caught under the wheels a couple of times. With the ground now built up and leveled, the springs lifted and the mud flap bar bent back into shape we should not have that problem anymore. Thursday night in the wind and rain as I was walking Donnis to her car as she headed out for night shift at the Nursing Home I discovered a couple of toad stools growing out of a plant pot. The toadstools are a creamy colour moving to yellow at the top. They really stand out as a ghostly colour in the night. That was also the night the frogs in the area started celebrating the rain and the damp. Not only can they start mating but there is an increase in mozzies and wrigglers. Frogs love mozzies and wrigglers. The noise was a cacophony of frog calls all night and has been every night since. Walk outside and it is almost like a wall of sound. Not like the Phil Spector Wall of Sound. Can anybody can remember Phil??? Today there have been increasing periods of sunshine which is a problem as the humidity levels scream upwards. Last night we went to bed without AC. The night was cool, about 20 degrees C, so we left all doors and windows open to take advantage of the cooling winds which found their way indoors. I woke a little after 3am hot, sweaty and uncomfortable with some half formed half remembered dream on playback loop in my head. I put my pillow and myself at the foot of the bed in the hope of it being a little cooler. It was no use. I tossed and turned and the half formed dream was now on fast forward. I turned on the AC closed the bedroom window, the ensuite door and the bedroom door after stepping into the hallway. I stood at the front screen door and listened in the darkness to the falling rain – heavy – the strong winds and the frog orchestra. After a few minutes I went back to the bedroom and in that short space of time could feel the cooler air and lower humidity levels. I feel asleep with the sheet over me only to wakened by the telephone at 5am when the Nursing Home called Donnis asking her if she would like an early morning shift at 6am! I had walked to our bedroom door and heard the message recorder on the phone in the kitchen kick in. I refuse to have a phone in the bedroom, even mobile phones are confiscated. I went back to bed and pulled the light cotton blanket over me (Donnis had pulled it over herself when the AC was turned on) and went back to sleep. I woke at 7.40am. That is almost a late sleep in record for me. If not a record it is in the top three. During the day today the sun had made a few brief appearances but mostly it has been overcast and threatening rain although it has not rained since I woke this morning. Looking across at the mountains it is as if I am looking through a veil of gauze. The humidity is so high without raining. It is like walking through water and Donnis says each breath is an effort. The humidity has invaded everything. Even clothes in the wardrobe, laundered and ironed now feel limp and heavy with mositure. Donnis was packing to go to Canada and because the clothes have humidity they also have extra weight so she may have to put the clothes through a drier before packing them. My clothes are hanging limply on me. We should put on the AC but will persist until after our showers then turn on the AC in the bedroom. Outside it is almost dark at 5pm due to the heavy cloud layer. I just checked the radar. There is quite a bit of rain about 150 klm south of us and a little rain about 300 klms to the north. Nothing else is showing up on the radar. This weekend I finished cutting a shelf (well a couple of shelves) for the MH. I have put on several layers of varnish. They look quite good. One has been installed the other still needs some support brackets. We have also decided another overhead locker will have a lower shelf, with dish rack above and a book shelf to one side. That will really test my carpentry skills. 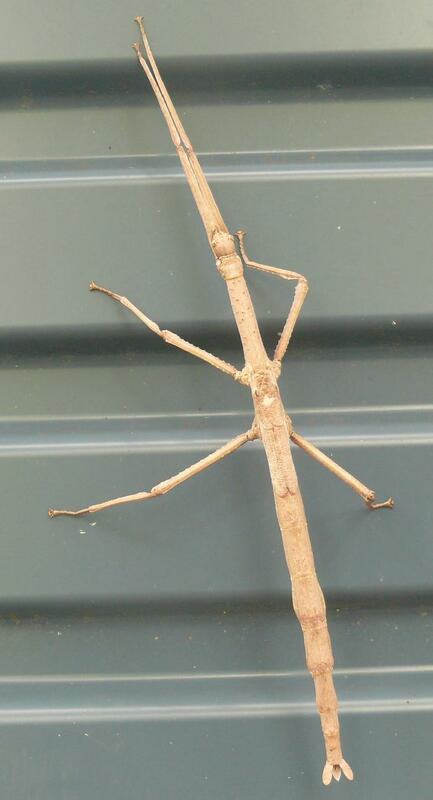 This morning as I went to start varnishing I noticed the biggest stick insect I have ever seen on our gargage door. I thought a photo would be a good idea. Look at the size of his little eyes. Our Stick Insect. Really looks like a stick. Boo Hoo. 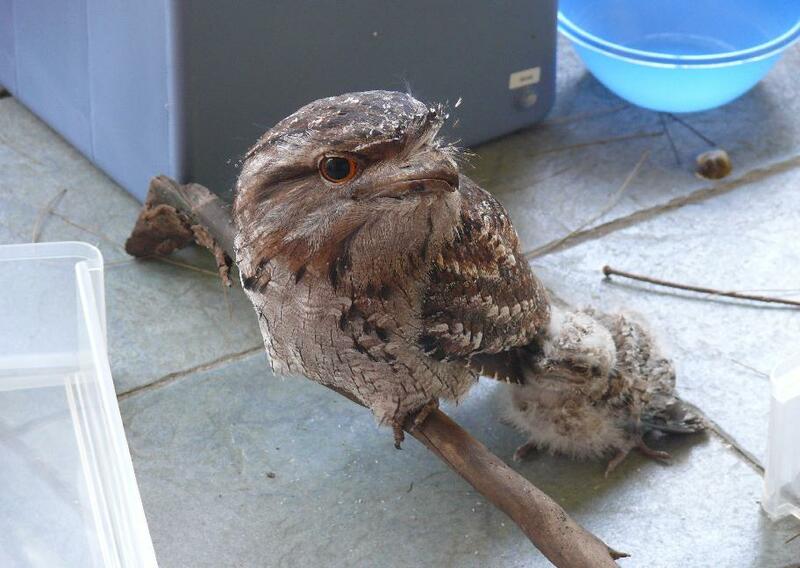 The little tawny frogmouth chick and its parent are gone. We came to work on Thursday morning and there is no sign of them. We really do not think the chick had enough strength to fly away so perhaps there are other reasons why they are both gone. The chick was beginning to take on the colouring of the parent and was no longer looking like a ball of fluff. It now had feathers and looked like a small version of the parent. Regretably Thursday was also the day I took the camera expecting to take some fresh photos of the progress in its life. Yesterday while in the garden I heard a bit of a scurrying sound in the undergrowth. I am always wary there may be a snake, after all we do live in snake territory. Anyplace in Oz, outside city streets are likely to have snakes and where we live is home to some of the deadliest snakes in the world. However I have only seen one snake in all the years we have lived here. It was a dark green, almost black, tree snake. I have seen dead snakes around the streets and one very large carpet snake one morning in the street at the back of our house. I digress. The scurrying sound, upon investigation came from a little chick. This one is a baby Stone Curlew and has strange long legs for such a little creature. No sign of the parents, in fact I have not seen them around for several months. Thursday there was a tropical cyclone way up north above Cooktown. By Friday it had become an ex Tropical Cyclone. By Saturday lunchtime a new cyclone had formed off the coast from Cairns. Although a category 1 it can still cause damage. 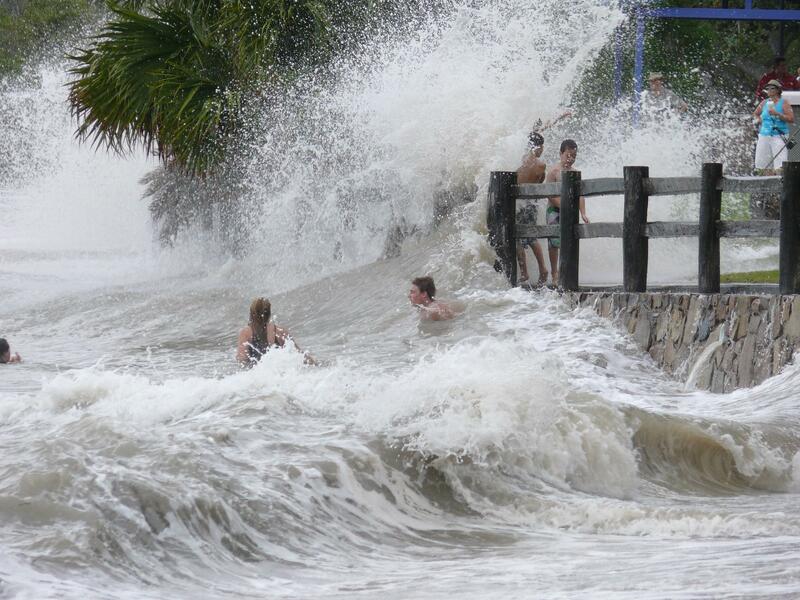 It is expected to pick up intensity over the next 24 hours and cross the coast between Port Douglas and Cairns. One thing we know about cyclones is they never do the expected. Here the wind is picking up and rain showers come along from time to time. If the cyclone does cross the coast Monday morning the resulting rain depression could move south and dump lots of rain on us. I am awake at 2.30 am Sunday morning (woke up and could not go back to sleeep) and will be back in bed soon. (I hope) Will know more when I wake later in the morning and check the latest reports. The cyclone turned into a tropical low and is drifting across the top end of Queensland – The Peninsular Country – and will probably reform as a cyclone when it reaches the gulf on the other side. No sigh of relief though, the ex tropical cyclone ” Neville” has been hovering around the coast and has intensified as a severe weather warning. Still with strong winds up to 100 Klm per hour and expected to dump some heavy rain overnight and Monday morning particulary around Airlie Beach and Mackay. It is Monday morning as I edit this post. Still in my jammies as I did not go for a walk this morning. I did my back maintenance routine which includes up to 10 minutes on the inversion mattress and another 5 minuters of yoga tucks but I really need a good walk but I am not going walking and getting rained on. We had the AC turned on last night so we could sleep. It is so humid that everything feels damp. If we had strong winds and heavy rain during the night it would probably have woken us even with the AC turned on. It is still a little dark although normally at this hour there is plenty of sunlight. There is heavy cloud cover and the ground is still wet. It is raining lightly but persistantly. It is also still out side, not a breath of breeze although the latest weather warning issued at 5.25am still forecasts heavy rain and strong winds. To be safe we closed the windows in WHEREWILLWEGO. If the rain does get blown horizontally by the wind we do not want WWWGO getting wet on the inside particularly the bed. Donnis bought a Roman Blind for WWWGO to close off the driving area from the living area and save on AC costs. The gap is 112cm wide and of course she bought a blind which is 150cm wide. We pulled it apart and while I cut the timber top rail and slats she cut the cloth and restitched. We screwed bits back together as a joint effort and perhaps next weekend we will install it in WWWGO as a joint effort. It should look quite nice when installed and will be an attractive piece of furnishing. It seems to match the colour of the curtains and at $25 when on special may turn out to be a bargain. In fact it is hot summer!!! We have to expect it will be hot this time of year. Hot and humid. The weather forecast for the next couple of days has northerly winds swinging from northeast to northwest. That is when life really becomes uncomfortable. The winds just make everything seem even more sticky and hot. It also makes the skin feel gritty. The humidity levels skyrocket but there is no rain. This week there is a low expected to turn into a cyclone which may bring in the southerly winds and perhaps some real rain. Until then it is just hot and sticky and my car is an oven as I have not done anything to get the AC fixed. The rain we had last week has not penetrated the ground nor was there enough for runoff into the dams. It was enough to wake the grass. The grass woke, yawned and stretch and called out to its friends and neighbours, “c’mon time to get up and growing”. All the grass responded particularly the guinea grass which is as high as an elephants eye. That stuff I have to dig out roots n all. The rest I have to mow and whipper snipper. Within 5 minutes I am drenched in sweat and all energy is drained from me as I need water. Ignore the thirst signs for too long and vision gets blurry, a headache begins and the shakes are not too far away. A wise word for anybody new to the tropics and the heat in general. Stay re-hydrated at all times. Most of the weekend is spent trying to stay out of the heat and finding something to do which can be done in the shade (or in AC) and does not need much energy. I have planned to make some shelves inside the cupboards of WWWGO and for the most part that will keep me inside with the AC turned on. Next weekend I will actually buy some timber and a jigsaw and make a start instead of just thinking about it. I have added a new link for RV Dreams a site for the USA which I have been reading almost daily for 5 years. The frogmouth is growing and changing colour. It is now living on the verandah edge with the parent next to it. Both just sit there and look down on to the nature strip beside the creek. I guess another week or two he will try to fly when he develops tail feathers. His big cute yellow eyes tell us he is well aware of us being around and he can swivel his head through 180 degrees. No! Not ours! 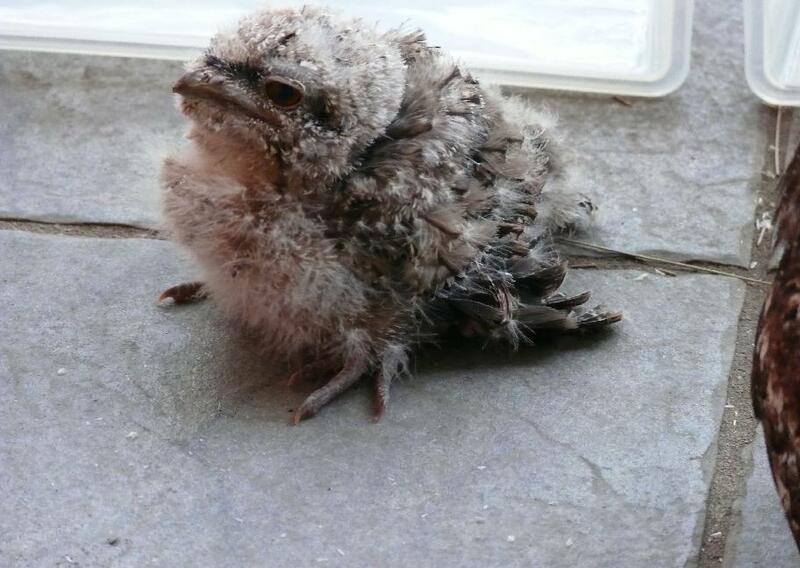 A little fluffy tawny frogmouth chick. First Chick which fell on the ground and later disappeared under mysterious circumstances. The nest, which was not much of a nest to begin with is falling apart. The chick is in danger of falling out. Ian at work climbed a ladder and knocked it down into a box filled with pine needles held by Sally just below. They took the chick onto our office verandah and left it in the nest box. I suggested we put a couple of fallen branches on the verandah so the parent can have somewhere to stand guard over the chick. The parent stayed in the tree all day but next morning was on the verandah keeping watch. On the branch on the verandah. Parent and second chick on office verandah. 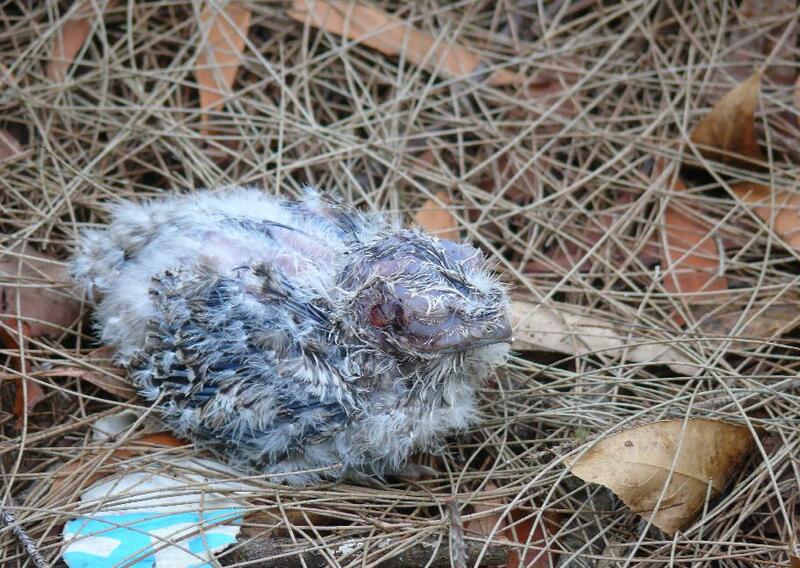 In tawny frogmouth circles new chicks back out of the nest and hang their rear ends over the side to defecate. This poor chick is backing all over the verandah and cannot find the edge. It probably will eventually but could fall off. So we blocked off the verandah edge, I picked up the little off white ball of fluff and put it in the nest we made. The parent kept an eye on me and apart from opening its beak and making noises did not try to attack me. Over the next few days I have seen the chick changing colour until it now has similar colouring as the parent. The gawky wings which seemed to be a hindrance are now taking shape and it is looking more like a bird. The ugly duckling turning into a swan err ummm you know what I mean! We have been chasing the kookaburra away but it keeps coming back. Looking for an easy meal. On Saturday my daughter Averyl and her children Shelby – Rose and Anakin, drove up from Mackay for a visit. They left Paul at home as he was unwell and not keen on the trip. I made spaghetti bolognaise for dinner with toasted sourdough bread on the side. It seems like the correct choice as there were no complaints and everything on the plates got eaten. Even seconds. After dinner we played a little Wii before putting on a movie “Ice Age Three”. Both Averyl and Shelby – Rose fell asleep within minutes. Anakin and I made the full distance. Donnis was having a hard night at the nursing home. 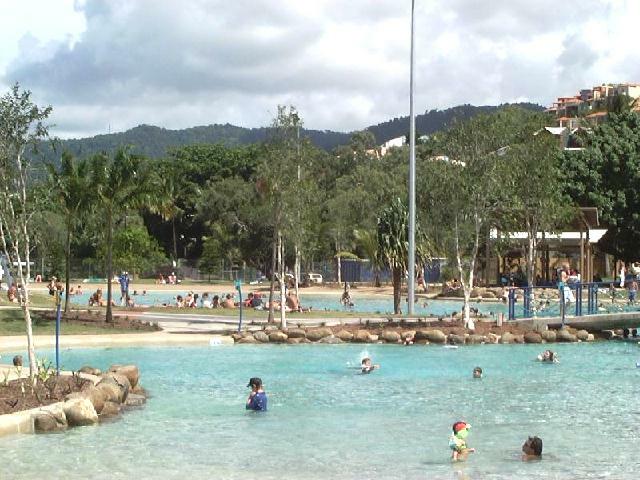 Today we took the kids for a walk along the Cannonvale Beach to Airlie Beach boardwalk then the kids had a swim in the lagoon. We had Brumby’s Pies for lunch then another round of Wii games before Donnis headed off to the nursing home and Averyl and tyhe kids headed back to Mackay. A pretty laid back weekend for me and for once I did not feel guilty about not getting any yardwork done. As I type this late in the afternoon a family of tiny honeyeaters are chittering outside my window as each one takes a turn flying down to a garden ornament with water in it. As each one drinks its fill it lets out a “chirrup” and flys into an overhanging tree when another flys down. Sometimes three or more are in the ornament while one keeps watch. The weather all weekend has been windy, as forecast, hot, as forecast and with rain although not fully as forecast. It was supposed to be heavy rain. It has been more like heavy occassional showers. So far the ground just below the surface is still dry so there is probably not much runoff into the dams. We moved from one year into another in a seamless blurr. Well, not really a blurr but it was seamless. After dinner on New Years Eve we watched a little TV. I was not inclined to wait up until midnight and drive to Airlie, look for a parking spot, watch fireworks for 15 minutes then join the crowds heading home. I was struggling to stay awake watching whatever movie we were watching. We were in bed just before 10pm and I was asleep in moments. I woke during the night somewhere around 4am but quickly fell asleep again. So much for welcoming in the new year. New Years Day was hot n humid with patches of rain. I made a start on pulling our water fountain apart to find out why the pump no longer works. I was sweating so badly it was dripping into my my eyes soI made a start on preapring to install a new 2way radio aerial on “WHEREWILLWEGO”. Then the same sweating thing happened so I sat on the back verandah with a little breeze and assembled the new whipper snipper I bought on Boxing Day. Still sweating profusely I retired inside the house with all fans working flat out while I read blogs on the internet or watched the drizzly rain. Then it was back out to work on the fountain for awhile. Pulled the pump apart and cleaned out the mud and tiny bits of seed or whatever was in the impellor chamber. Viola! It works again. The fountain feature base actually broke off earlier in the day when I was pulling it all apart. Hmmm. Will have to re-think how this feature will work in the future. After dinner on New Years Day Donnis left for her night shift and was left to struggle once more staying awake watching TV. I was in bed by 10pm. Do you see a pattern emerging here? About half past midnight I woke thinking I could hear my mobile phone ringing. I had the AC turned on and doors closed in the bedroom. The mobile was on the dining table. The ringing stopped. Then it started again. I stumbled to the dining table, found the phone and answered it. A voice started to tell me somebody was calling reverse charges. That person was allowed to say his name. It was not a name I knew. The message was repeated. Then as I was trying to recognise the name the operator came on the line to say the caller had hung up. I do not know how anybody else reacts to late night early morning phone calls, particularly those that wake you. I do not react well. I get the shakes as any call after 9.30 at night is usually an emergency or a nuisance. Either way I have trouble going back to sleep. After tossing n turning for ages I fired up the computer and read blogs for an hour until I felt drowsy then was back in bed and thankfully, fell asleep, waking at 7am. Sunday was repeat of Saturday. Hot n humid. The fountain is working but I put the surrounds back in a hurry and it looks untidy. Sigh! The radio is aerial installed but needs a final finishing touch, a soldering iron to attach th cable to the fitting into the back of the radio. Will have to borrow a soldering iron and perhaps its owner during the week. It is going to be a 2 person job. At the end of each day my clothes have been wet n soggy. In the humidity it does not take much of an exertion to bring on perspiration. We have to keep drinking water otherwise dehydration quickly sets in. I realise that although I mention we live in Airlie Beach I do not show many photos. Way back in 2002 a wonderful central area known as the lagoons was opened. This is a great place for people to meet, have a swim, laze in the water, barbecue and picnic. It is a safe water environment with lifesavers on duty. Of course over the years the area has been changed with new features and more shade. It is a great place for singles, couples, families and groups. 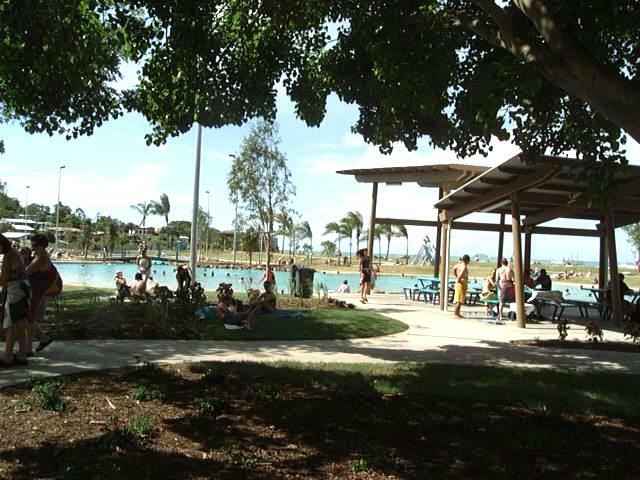 The idea of the lagoon has been taken up by other larger towns and cities such as Cairns, Townsville and Mackay. The great news is, it is all free. I have not taken any recent photos but below is an early photo taken in 2002 shortly after the lagoon was opened. I used my original digital camera, the Panasonic NV-DCF7 with 3 times zoom and 1.3Mp capacity. I now have the award winning Panasonic FZ50 with 12 times zoom and 10Mp.